I was extremely excited to read this book when it came out because it was getting so many fabulous reviews and I am thrilled to report that I thoroughly enjoyed reading this book. 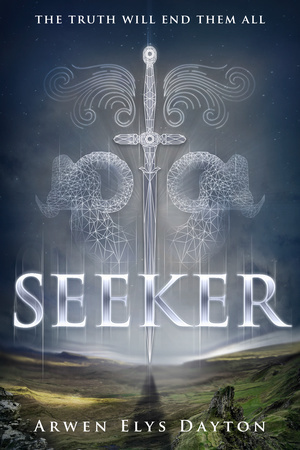 Seeker is a novel that takes readers on a whirlwind journey through time and space as Quin Kincaid follows her own path of self-discovery to find out what being a Seeker truly means. The world-building was awesome – although a bit complicated at times – and the characters were captivating. However, I will say that when I was reading this book, I found myself wondering about the history of the seekers, their families, and the Dreads. My curiosity about the backstories and histories is the only serious drawback that I really encountered while reading this book. This was an entertaining, fast-paced read, but it wasn’t life-changing. This isn’t a book that made me feel like I wanted to dig into the themes and motifs to try and find a way I could use it in my classroom with my students. I also haven’t found myself telling people that they should be reading this book and recommending it everywhere I go.